We are the Casino party professionals! We bring the glamour, glitz and excitement of a Las Vegas Casino to your special event Nothing compares to the excitement of playing casino games! Now you can bring that same excitement to your next event. Our casino parties are a unique blend of fun, excitement and professionalism! 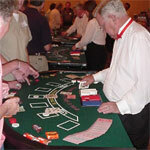 Our dealers are player friendly and teach your guests how to play and win on all of the table games. We use only authentic casino gaming tables and we deliver them to your location with everything you need for a successful event. All you need to bring are the Players! 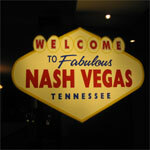 Michael B’s NashVegas Casinos specialize in planning and organizing your casino event. You tell us how many people will be attending and we will quote you a price for the right amount of tables to give everyone a piece of the action. Your quote includes the gaming tables, chips, cards, dice, play money, raffle tickets, professional dealers, and our experience. No matter what your guests are playing, Slot Machines, Poker, Black jack, Craps, Roulette, Wheel of Fortune, Bingo or Texas Hold'em, Michael B’s team will ensure that you and your guests have an unforgettable event. Whether you are having a birthday party for 50, or a corporate event for 1000 people, NashVegas Casinos has the experience to help you get the job done right.